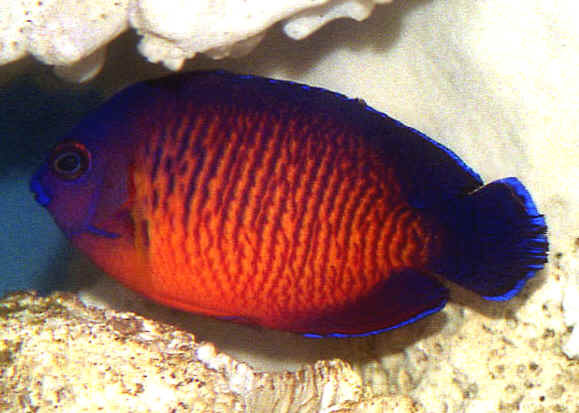 Amongst the genus Centropyge Angelfishes, the group most inclusively labeled "Dwarf Angels" in the marine aquarium interest, there are some species that are certifiably "tough" (e.g. C. argi, C. aurantonotus, C. resplendens), others that are typically not hardy (e.g. C. potteri, C. flavissimus) and a bunch in the "sometimes good, other times not category, including the Coral Beauty. Over its range this fish can be suitable for aquarium use, but many times proves difficult, mostly dying "mysteriously"... consequent from... a lack of adjustment/poor habitat, lack of nutrition, "stress", accumulation of insults from capture, handling, shipping? Here is our input re "tilting the scales" in your favor in the selection and husbandry of Centropyge bispinosus. The Coral Beauty occurs widely in the Indo-Pacific, from East Africa (excluding the Red Sea) to the Tuamotus in French Polynesia, north to the Izus of southern Japan, south to Lord Howe Island of Australia, towards Hawai'i and the South Pacific. This is a mid-size dwarf angel of about 4 and 1/2 inches maximum length for males, perhaps a half to full inch less for females. Centropyge bispinosa (Gunther 1860), Two-Spined, Dusky or Coral Beauty Angel (2). Usually hardy from everywhere but the Philippines. Found widespread throughout the Indo-Pacific to central Pacific. Pix by Hiroyuki Tanaka and RMF of one in captivity and one in Australia. 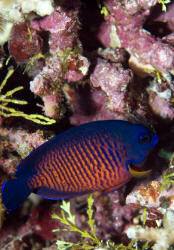 C. bispinosus is a secretive species that lives singly or in small groups of 3-7 individuals (with generally just one male in a harem) near and amongst rock and coral covered lagoons and seaward reefs. If you are looking for a specimen that will be out and about during the day, this is not it. Systems that house this (or other Centropyge species for that matter) should be well-established, with lots of live rock with filamentous algal growth (for food), and many gaps in the decor (rock, skeletons or live corals) for them to dart amongst. A minimum of seventy five uncrowded gallons is required for keeping this small angel happy and healthy. Larger is of course better. Arranging piles of rock and hard and soft corals in at least two definitive clusters allows for more natural behavior and determinate areas for your livestock to flee and aggregate depending on mood. Thus, wider, flatter "standard" as opposed to "show" tank formats are preferred. Filtration should be what one would use for a "standard" reef system... best to use a remoted sump/refugium, with alternating light cycle, a Deep Sand Bed (DSB), purposeful macro-algae (e.g. Gracilaria, Chaetomorpha) growing there... allowing a quieter place to mount ones skimmer, heater/s... whatever you want to use for chemical filtration, supplementation. 1) Specimens that have been "on-hand" for a week or two. Most "mystery losses" of Centropyges occur in the early days of captivity... at night... likely the result of "cumulative stress" in capture (most are "needled" to decompress, bring to the surface, before or after being brought up), handling, transport, being in small transparent containers... from a lack of food during much of this time... Wait on new arrivals... if necessary, desired, available, putting a deposit down to "hold" a promising specimen for later pick-up. 2) Is it eating? Observe a prospective purchase for a few minutes... it should be looking about, nibbling on what is available in its world. If not, pass on it. 3) Look carefully at the individual. Torn fins and opercular spines "happen", and will regenerate, but there should not be evidence of missing scales, opacity or swelling of the eyes, whitish markings. On this last, please be aware of the high variability in coloring in this species. (See fishbase.org and Google Images re). 4) Behavior... again... this fish is cyanided at times in its collection in the Philippines and Indonesia... Buy it from elsewhere if you can is my opinion, but if you can't be sure of its origin, do avoid "too-bright" colored specimens, ones have "private parties" in the corner, up near the surface. Might include other shy, retiring fishes and non-fishes. In uncrowded conditions this species rarely over-nips sedentary invertebrates, including cnidarians. Unless the system is very large (hundreds of gallons), it is recommended that the Coral Beauty be the only Pomacanthid present. Grammas, Dottybacks, various gobies, blennies, Cardinalfishes... and the like make suitable co-tenants. Aquarists intent on trying a breeding harem, should provide a system of at least two hundred gallons, two or three "piles" of live rock, and place all desired individual specimens simultaneously... at a small size (under three inches total length). The dominant individual will grow a bit faster, become the first male. C. bispinosus is a "nibbler", a day-time continuous forager on live rock organisms, including a good percentage of filamentous green and red algae, small crustaceans, worms and molluscs. In captivity it is expedient to house this fish with a large quantity of well-established live rock, and offer other meaty foodstuffs as supplement. New specimens should be quarantined with some of this LR and their other foods soaked in a feeding enhancing adjunct such as Selcon, Zoe, Microvit. Here doing what they do most all day long... nibble. Most important in keeping this fish healthy is initially securing a healthy specimen. 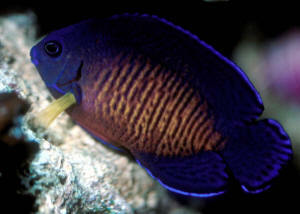 Don't buy "new arrivals", and take care when quarantining this fish, as it is often lost due to stress, non-feeding during this phase of acclimation, observation. Second amongst general causes of mortality is very likely "unsuitable environment"... including a dearth of space, healthy live rock, incompatible tankmates... A close and related third factor is a lack of nutrition. Do take care not to purchase a "too-thin" specimen, or have yours become skinny. This fish is hard to recover if it becomes too malnourished. Oh, and C. bispinosus is as susceptible to the "usual suspects" in the way of protozoan complaints, as other Centropyges. They might not be the first to show the symptoms of infestation ich (Cryptocaryon), and velvet disease (Amyloodinium), and unfortunately are sensitive to conventional treatment (copper with or w/o formalin formulations). Alternate dip/bath, biological cleaners, and other treatments are called for should your quarantine, maintenance procedures fail. Nutritional disorders like HLLE (head and lateral line erosion) are best combated via vitamin supplementation, inclusion of fresh (blanched) greens, and water quality consideration through filtration and water changing. A condition termed "dwarf angel bloat" in newly imported Centropyge appears to be an edema brought on by decompression trauma, and/or secondary bacterial infection associated with the same (especially where a thin needle is employed for expediting gas bladder deflation). Quarantine and oral administration or injection of antibiotics are the most efficacious interventions here. 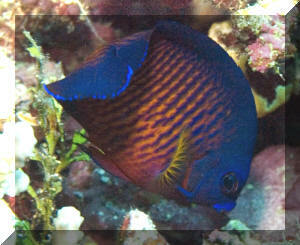 Though not produced commercially as yet in captivity, like other members of the genus the Coral Beauty has been observed in aquariums to engage in spawning behavior. In the wild they live like others of their genus, in small (3-7 individuals generally) haremic associations, with one alpha male, female and a few sub-dominant females. In the event of loss of the male, the alpha female becomes male. All dwarf angels investigated start off sexually undifferentiated, become females that turn into males with age/growth, a condition called protogynous (first female) hermaphroditism (possessing both sexes). Bauer, Joseph A. & Gerrit Klaij. 1974. Pigmy angels spawn (report of observed spawning of C. bispinosus). Octopus, bulletin of CSea, Cleveland Saltwater Enthusiasts Association. 8,9/74. Lamm, Darrell R. 1984. 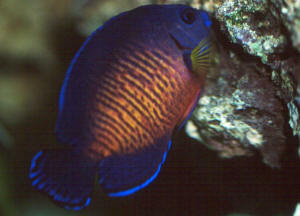 Spawning of the Coral Beauty angelfish. SeaScope Summer 84.